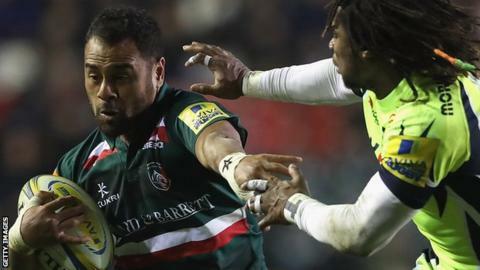 Leicester Tigers full-back Telusa Veainu is set to be out for at least eight weeks after sustaining a double fracture of his jaw in the Champions Cup defeat by Munster on Sunday. The Tongan was taken off during the 33-10 loss at Thomond Park after a clash with Ireland winger Andrew Conway. Head coach Matt O'Connor told BBC Radio Leicester: "We haven't spoken to the surgeon at length yet. "But conservatively it is an eight-week injury. It could be more. We will see."